It may be because this season is always met with so much anticipation, but it seems like every year once September or October rolls around I get the urge to make some sort of fall-themed mimosa. In fact, this exact same week last year I made this delicious Harvest Mimosa featuring pear, apple AND brandy, and you can bet it’s one of the first things on my list to make once Baby D arrives in just a few short weeks! 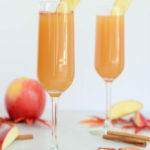 So here’s the deal with this Apple Cinnamon “Faux-mosa”: My primary complaint about most virgin mimosa recipes is they either taste (a) too sweet from an overload of juices (both sparkling and still) or (b) the sweetness problem is overcompensated by using club soda to add bubbles, but then the drink tastes incredibly watered down. Well, I’m proud to say this Apple Cinnamon “Faux-mosa” solves both those problems! It took a bit of trial and error, but I tasted through a couple of brands of sparkling apple cider and found one that isn’t too sweet. I’m sorry to say that I didn’t write down the brand and discarded the bottle, but I highly suggest you make your own decision on this anyhow as the perfect “faux-mosa” is largely a matter of personal taste anyway. You’ll also be adding some still apple cider on top of the sparkling apple juice, which tends to be a bit more concentrated. Plus, if you get your hands on a high-quality brand such as Trader Joe’s Honeycrisp Apple Cider, you’ll get tons more flavor in every sip. 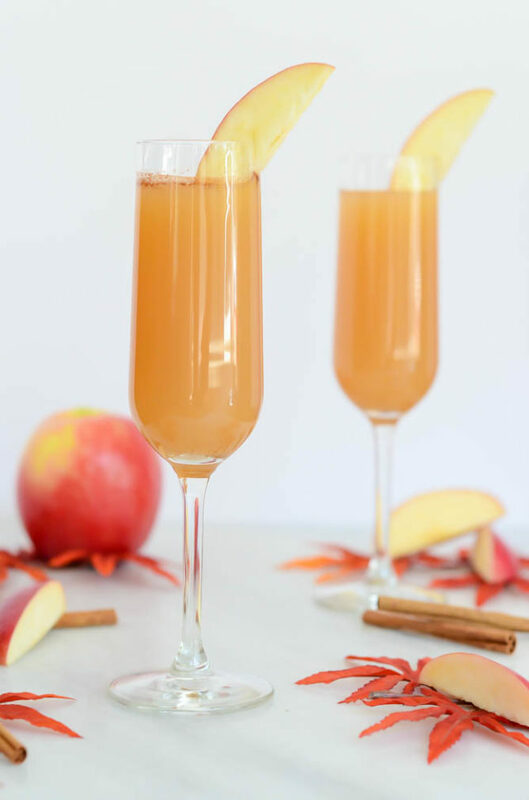 Finally, an Apple Cinnamon “Faux-mosa” just wouldn’t be a “faux-mosa” without a hint of orange juice. I mean, we need to make this drink acceptable for breakfast, don’t we? I don’t know what your plans are for this weekend, but we have some big ones (shhhh….it’s a surprise – I’ll fill you all in on Monday!) so some Apple Cinnamon “Faux-mosas” are definitely in my very near future. Cheers to a relaxing weekend that I hope is filled with all the fall-themed things! 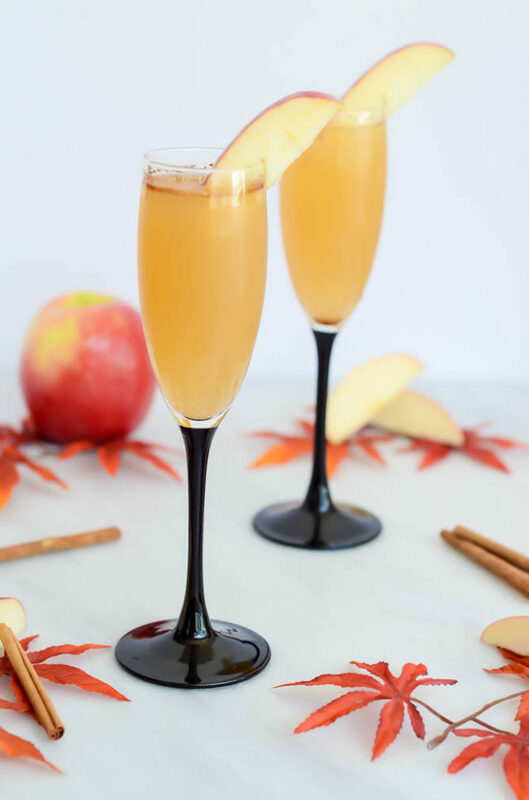 This virgin take on the mimosa features tons of apple-cinnamon flavor - perfect for kids, drinkers and non-drinkers alike! 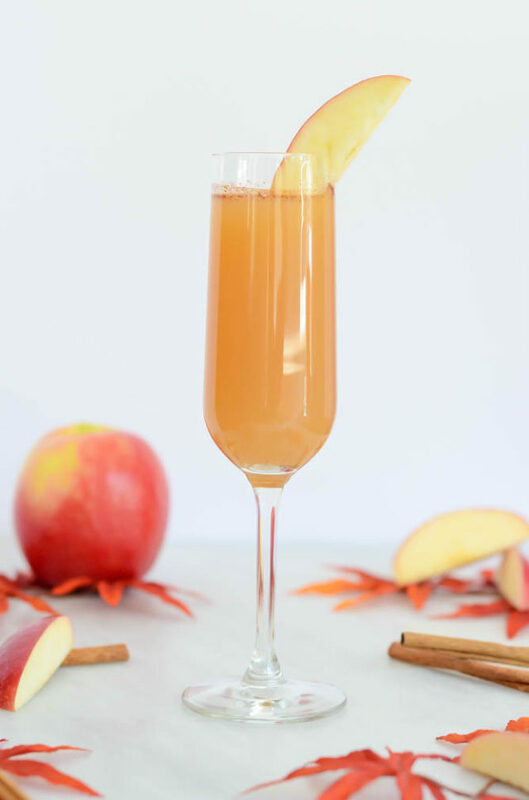 Pour both apple ciders and orange juice into a champagne flute. Top with a dash of cinnamon and garnish with an apple slice.